In age, I am certainly closer to my death than to my birth, so my limited fall-color experiences are precious indeed. Sadly, this year Oregonians and I were cheated, for most trees went from green to brown in our chilling November weather. 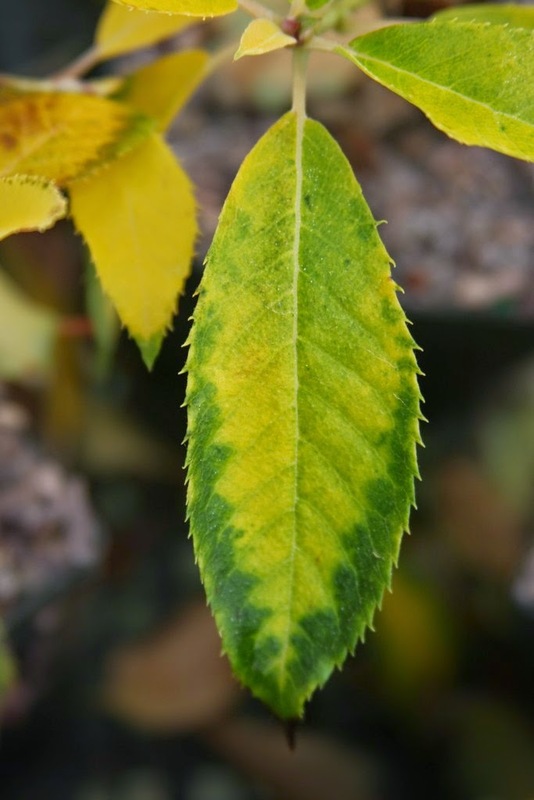 What is most galling is that the brown leaves will persist throughout the winter on many cultivars. 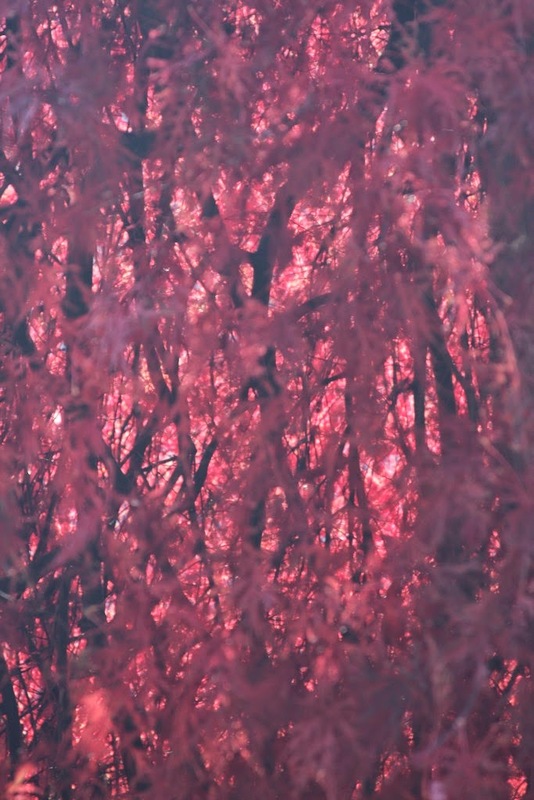 With Acer palmatum 'Shaina', for example, the burned leaves will only fall as new growth begins in spring. One year we even tried to remove them with a leaf-blower, but to no avail. There might be damage to some plants, but most will come through fine. Our lowest temperature was only 19 degrees F – not so cold – but it came so early. 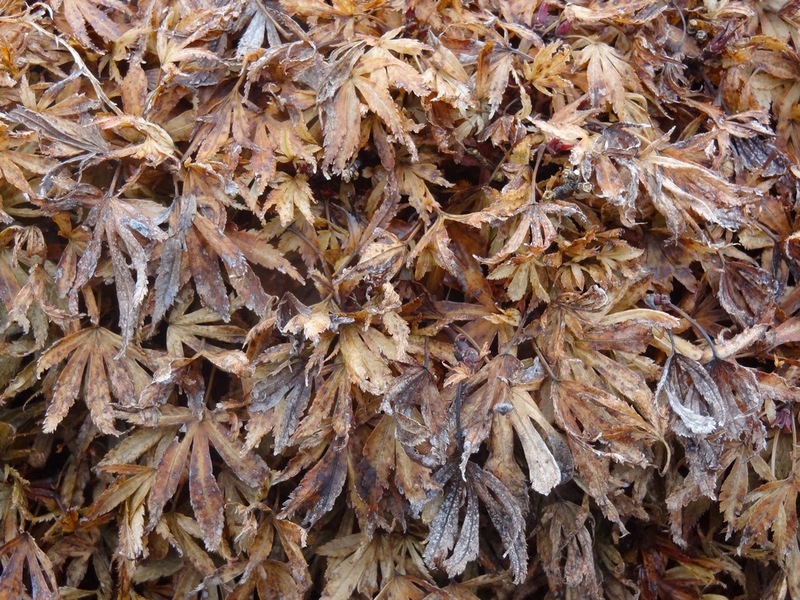 I explain some winter losses in horticulture by the observation: It's not how cold you got, it's how you got cold. And 19 degrees on November 13th, with no previous chill, means that my trees will look gloomy for months to come. I cringe to think about the many areas in America that had it worse, as in Buffalo, NY. Let's return to the brownless autumn of yesteryear*, when the scape was bright and cheerful, when our summer's endurance eventually led to a visual reward. *Yester is of Germanic origin, and was geostran in Old English, gisteren in Dutch and gestern in German; and all of that from Latin heri and Greek khthes. Year is also Germanic, related to the Dutch jaar and German jahr, from Greek hora for "season." In Spanish, ahora means "now." 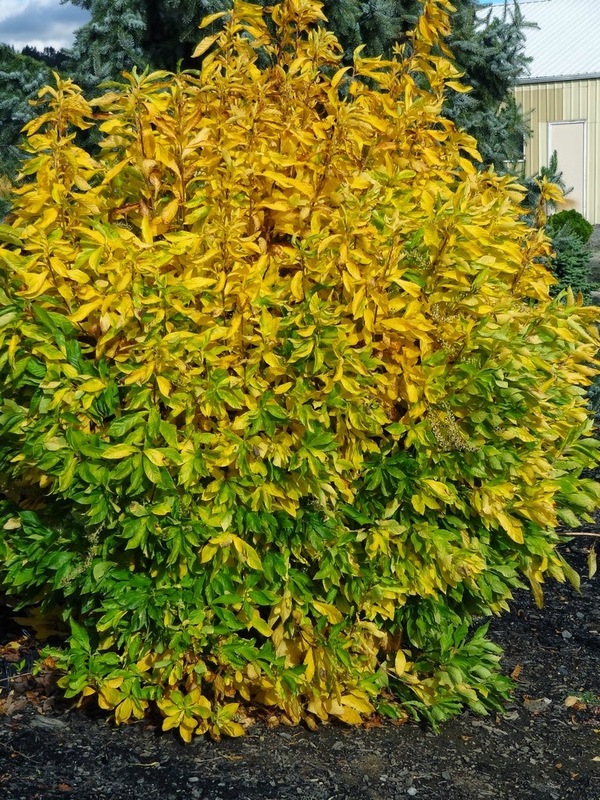 Ilex aquifolium 'Night Glow' is cream-yellow colored throughout the entire year, but its luminosity seems to increase with the dropping temperatures of fall and winter. The orange berries are particularly attractive at that time as well. I first saw – and got my start of – 'Night Glow' in the garden of Dr. Forrest Bump in Forest Grove, Oregon. I was visiting in the late afternoon on an overcast winter day, and it could not possibly be missed. I intentionally planted one along the road to my house, so I see "Night Glow" at least twice a day. 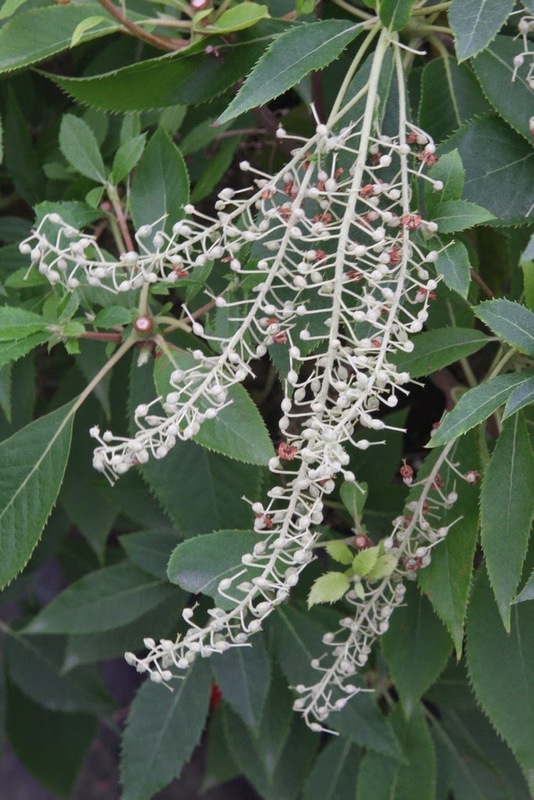 I grow a number of Clethra cultivars in the garden, but none of them sell worth a damn – except, for unknown reason – C. barbinervis 'Hime', a Japanese selection of their native species. C. alnifolia is an eastern North American species, and 'Fern Valley Pink' is an outstanding compact selection with deep-pink buds that was found in the wild in eastern North Carolina by Tom Clark of Fern Valley Farms. 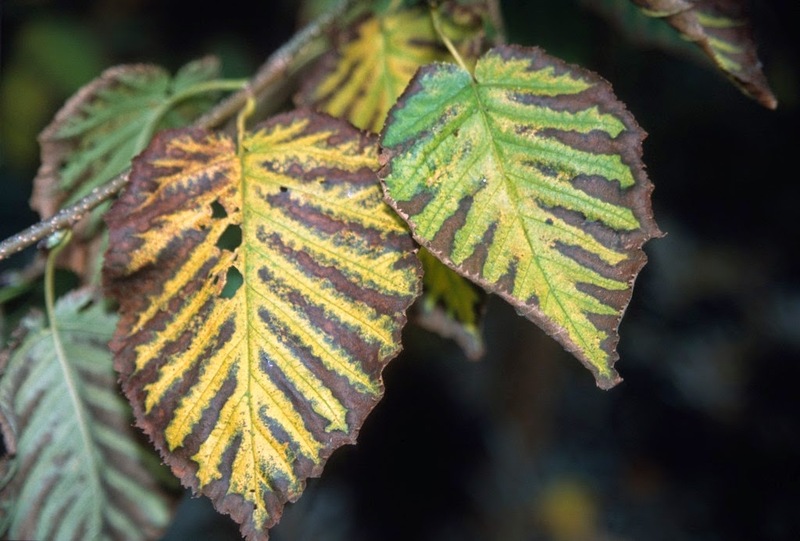 The generic name Clethra is from Greek klethra for "white alder tree," and the specific name alnifolia is due to the leaves' resemblance to the Alnus genus, an example of nomenclatural redundancy. The Genus name hamamelis means "together with fruit," for the previous year's seed capsules occur at the same time as the following year's flowers. The seed capsule contains two parts, each with one tiny black seed. When the fruit is mature the capsule splits and the seed is ejected, sometimes shooting as far as 30 feet. 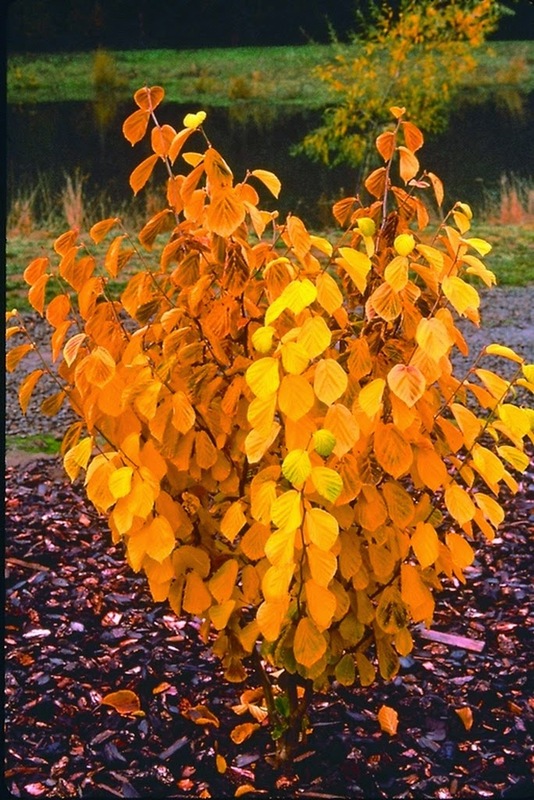 Hamamelis vernalis is the "Ozark Hazel," for it is native to Missouri, Oklahoma and Arkansas. 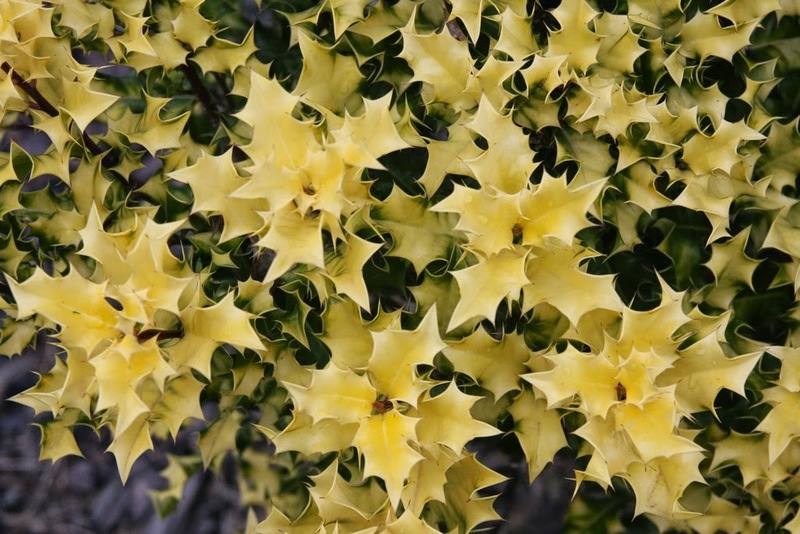 'Sandra' blooms yellow in spring (Latin vernal) and the leaves shine with brilliant orange in autumn. 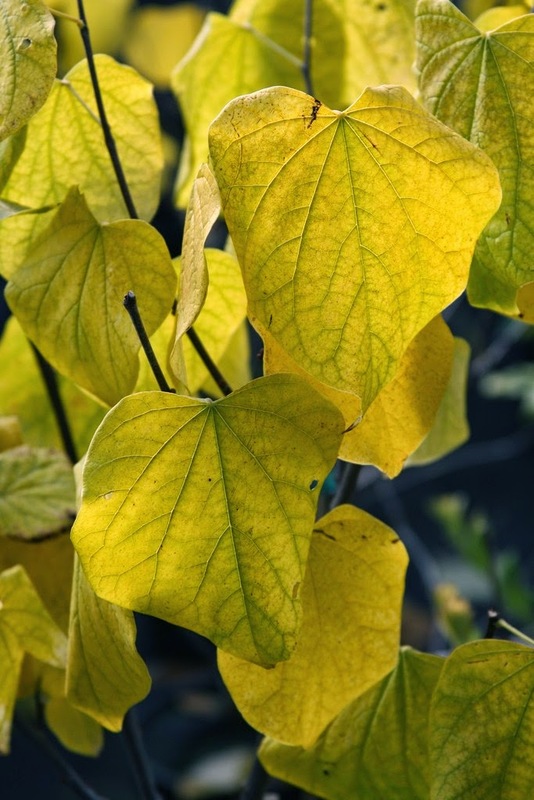 It was selected at Hillier Nursery in 1962 by propagator Peter Dummer and named for his wife. Dummer was smart to do so. 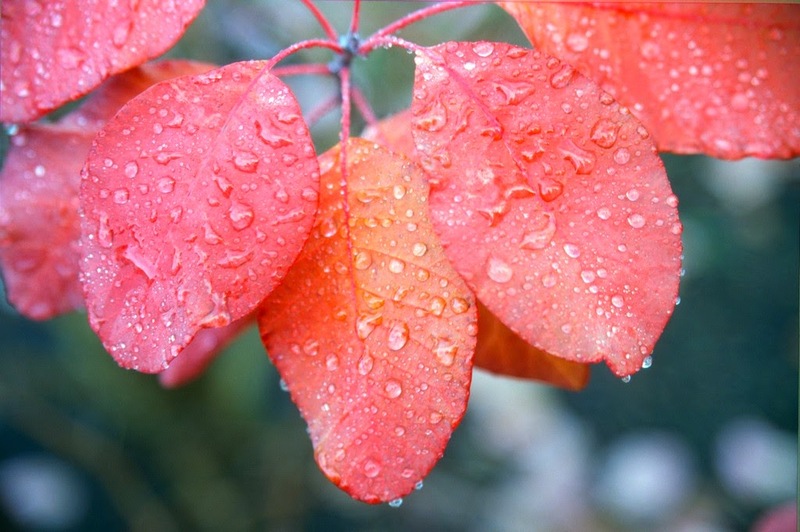 The genus Cotinus is a member of the Anacardiaceae family, so it is related to mango, cashew and poison ivy. 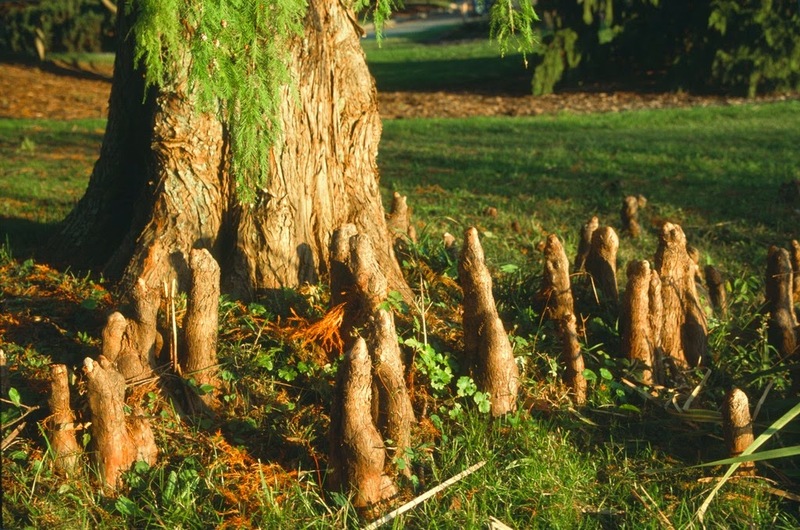 The species coggygria is native from Europe to China, while the American counterpart, obovatus, comes from southeastern locations. 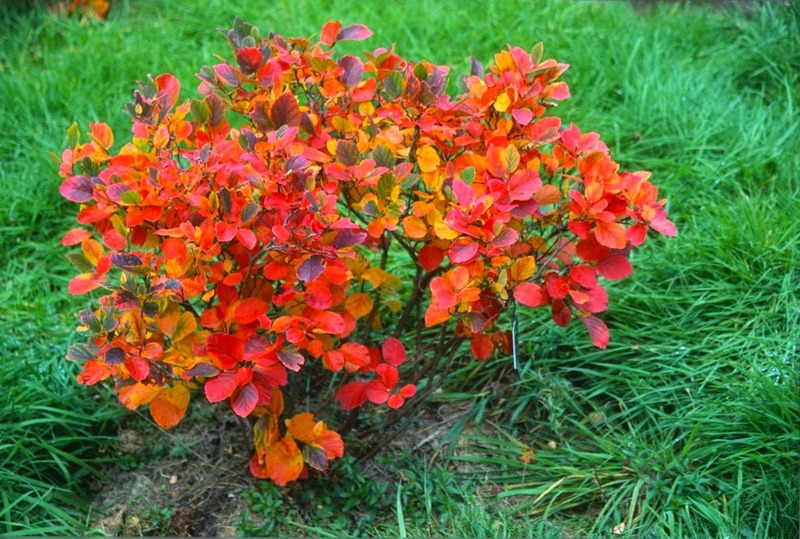 For some reason Cotinus is from Greek kotinos meaning "wild olive," but then coggygria is also from Greek kokkugia, meaning "smoke tree." 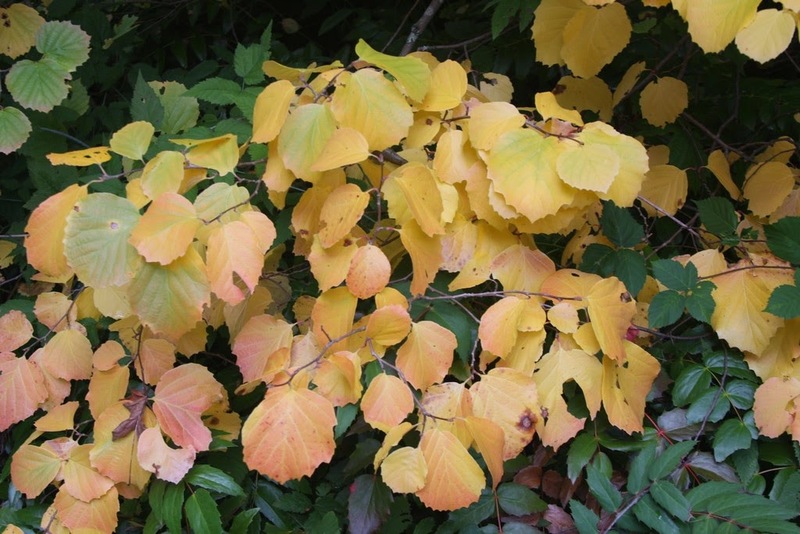 'Grace' was the result of a cross between C. c. 'Velvet Cloak' and C. obovatus, and was another Dummer hybrid, but named for a different wife than witch-hazel Sandra. 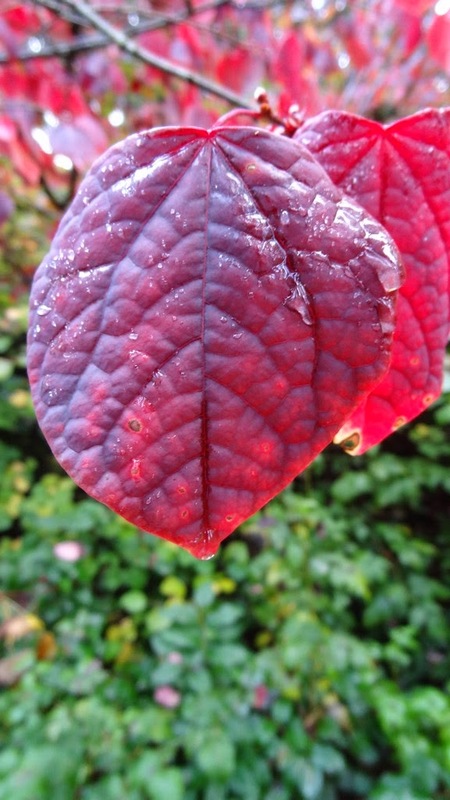 The genus name Fothergilla honors Dr. John Fothergil (1712-1780), an English Quaker physician who could boast of an extensive collection of North American plants. He corresponded with Dr. Alexander Garden (yes! ), a Sottish physician who moved to Charleston, South Carolina. Garden also corresponded with Linnaeus and sent him specimens, one being his discovery of Fothergilla gardenii, and it was eventually introduced to England in 1765. 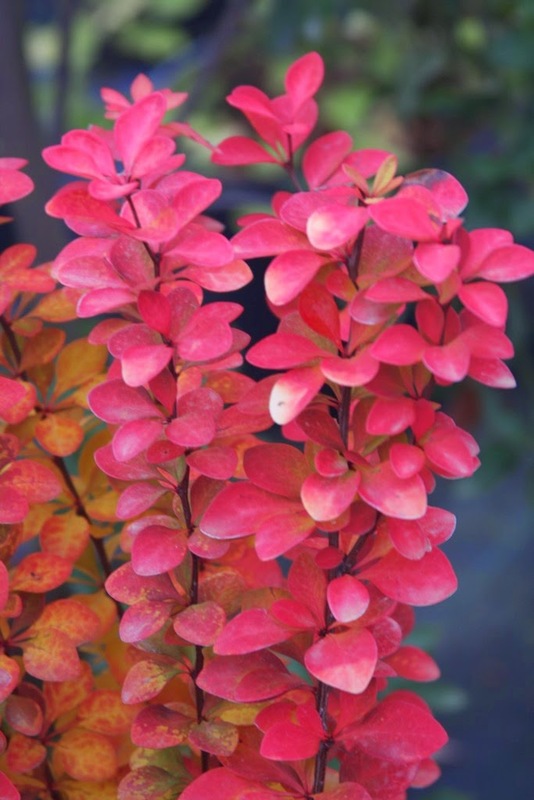 The species major, gardenii, plus their hybrids, make for wonderful shrubs with lush autumn colors. They were in limited supply, and snob gardeners would clamor for them when I began my career, but sales diminished for me about ten years ago, the snobs apparently sated. 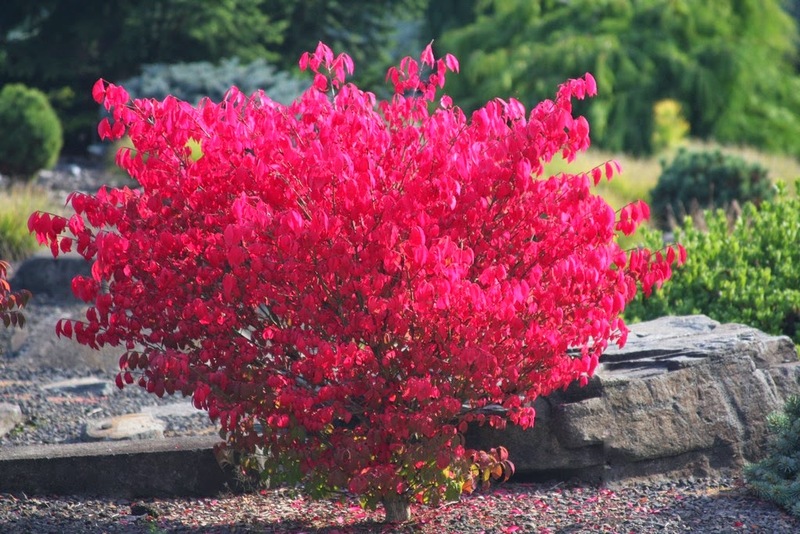 Nobody really likes or notices Euonymus alatus...until autumn, and then everybody dashes to their garden center to buy one. 'Fireball' and 'Little Moses' turn to brilliant red, plus they are nicely dwarf and compact. The species europaeus features 'Red Cascade', a small semi-weeping selection. 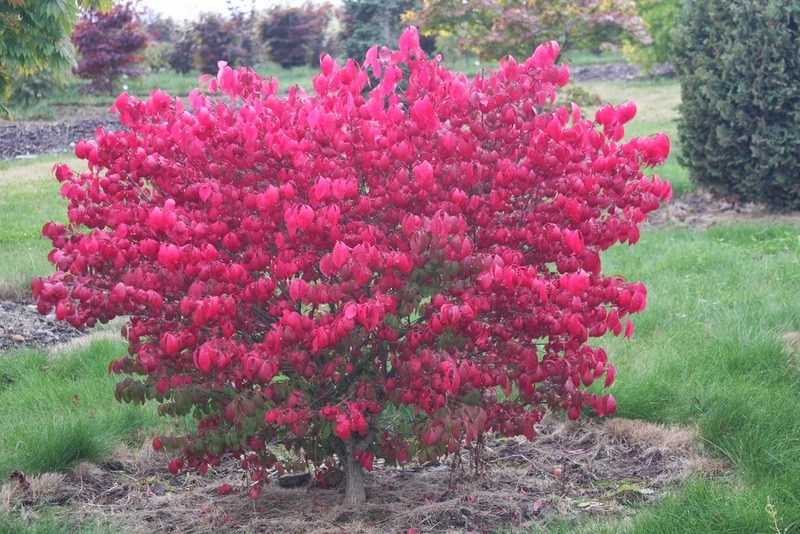 Linnaeus was fond of Euonymus, for he bestowed its Latin name from eus for "good" and onoma for "name." 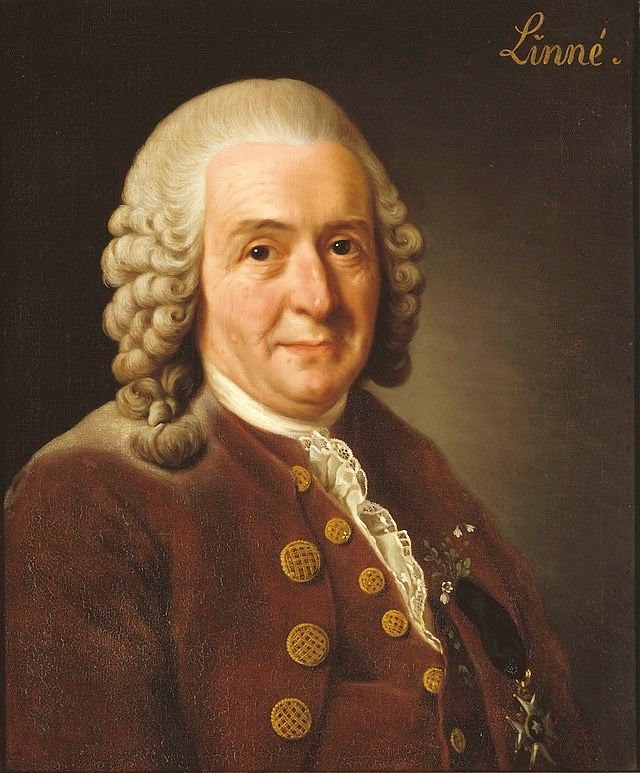 The Swede was so enamored with Latin that he changed his given name from Carl von Linne to Carolus Linnaeus. He was reportedly quite arrogant, and referred to his assistants as "disciples," for he relished the title of Princeps Botanicorum (Prince of Botanists) and the notion that he was the "Second Adam." 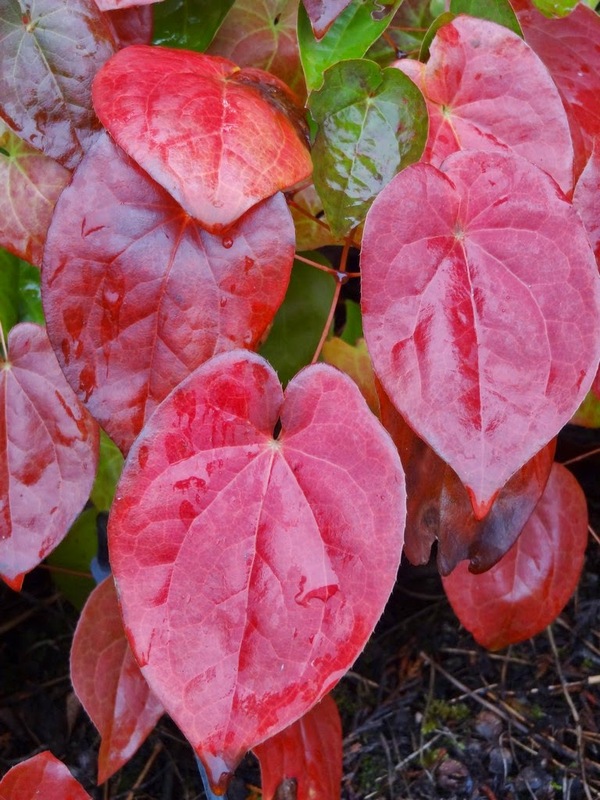 Epimedium is known in China as Ying Yang Huo, which translates as "horny goat weed." Legend has it that a herder noticed that his goats became more sexually active after eating the plants, and what do you know: the Chinese – herders and nonherders alike – have also used it as an aphrodisiac. Some modern human-libido researchers have focused on natural ingredients, and reports are that horny goat weed is among the top performers. There are a number of Epimedium hybrids, such as x versicolor, so even the species conduct themselves promiscuously. The botanist Maximowicz bestowed the botanic name for Disanthus cercidifolius from a Japanese source. 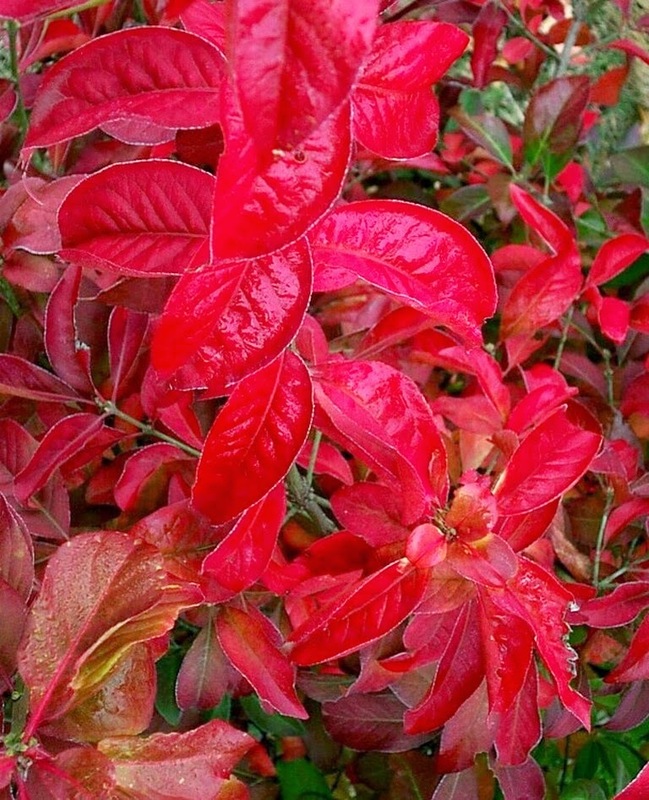 Locally it is known as beni mansaku which translates as "red hamamelis." 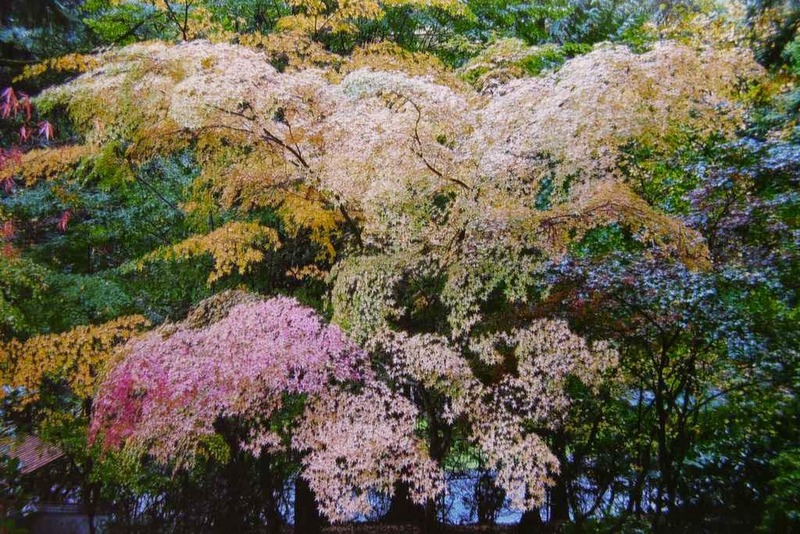 It is also known in Japan as maruba no ki, or maru (round) no (of) ki (tree), or "tree with round leaves." The Japanese subspecies is known as cercidifolius while the Chinese subspecies is longipes. The common Chinese name is chang bing shuan hua mu, and somebody please give me the translation. The generic name Cercidiphyllum originated from its leaf-resemblance to the genus Cercis; but Cercis is distinct, and often displays amazing pea-like flowers in early spring before the leaves develop. 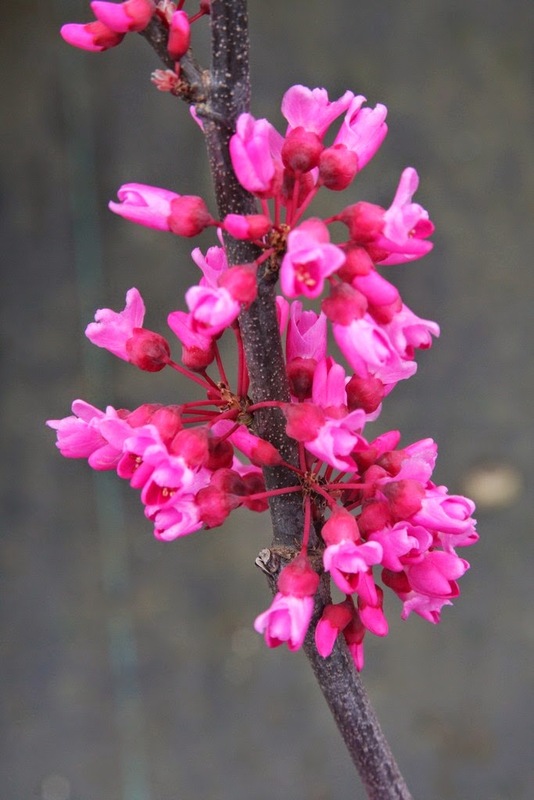 Cercis canadensis 'Appalachian Red' was discovered along a road in Maryland, and it features a vibrant fuchsia pink-to-red blossom color. 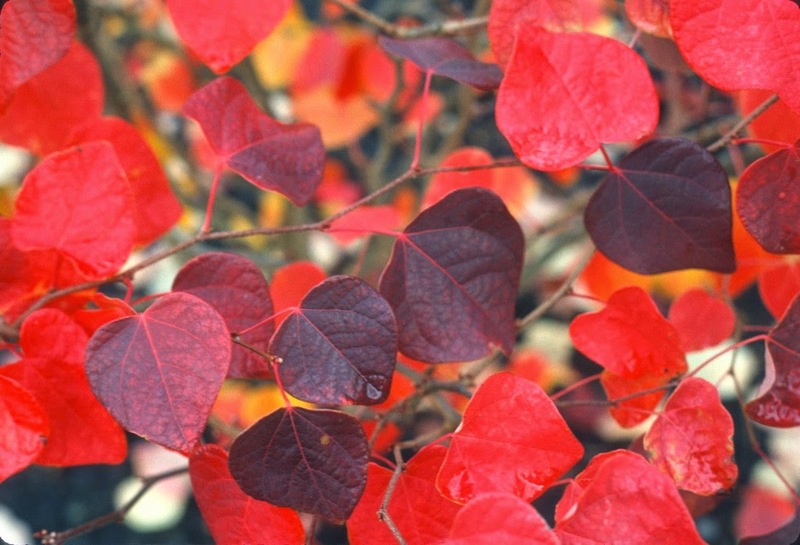 Actually all species of Cercis (about ten) show off with surreal, luminescent flowers, and then they amaze you with fantastic autumn foliage. 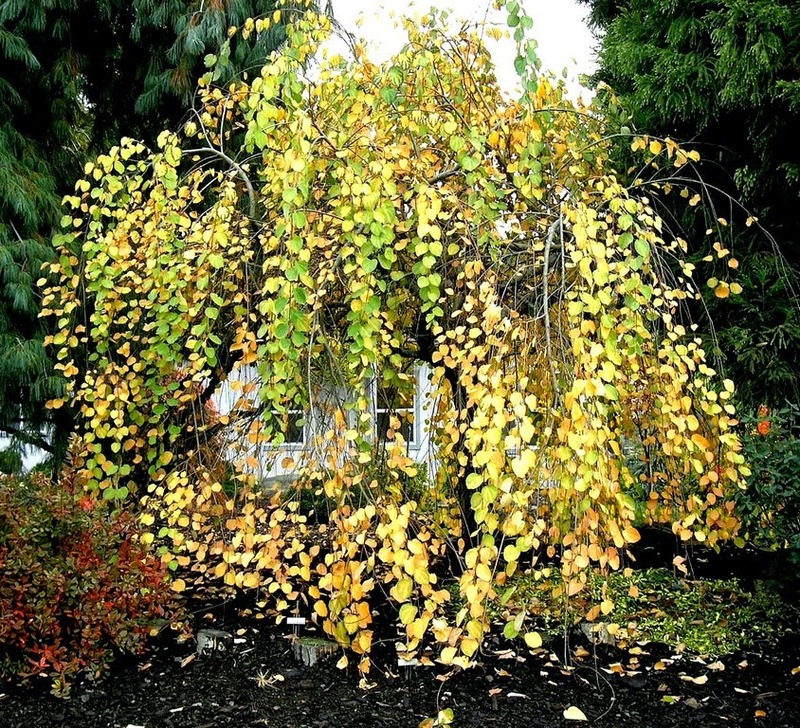 Cercidiphyllum japonicum 'Pendulum' is considered forma pendulum in The Hillier Manual of Trees and Shrubs, because "forms with long, pendent* branches have long been known and grown in Japan as chance seedlings from the wild." *Pendent is an adjective meaning "hanging" or "dangling," while pendant is a noun referring to something suspended from something else. 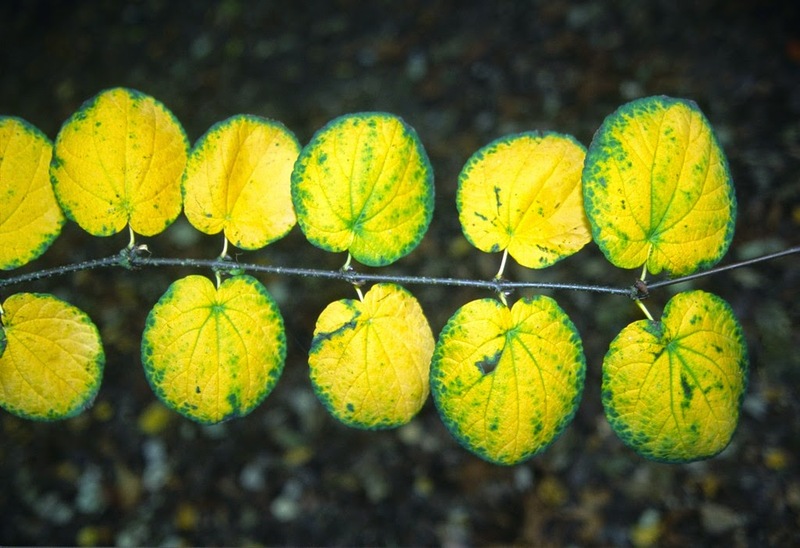 Cercidiphyllum magnificum differs little from C. japonicum, except the former's leaves are slightly larger and it is found at higher elevations in Japan. 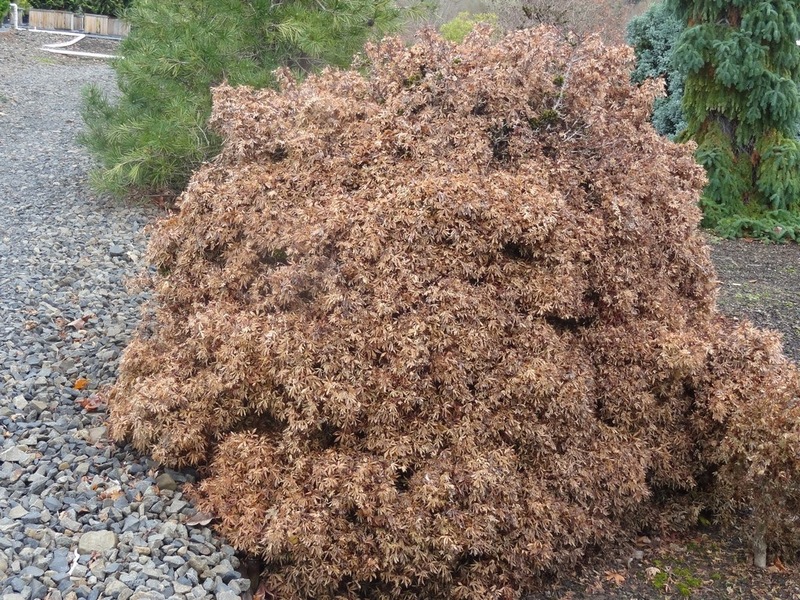 Berberis thunbergii 'Gold Pillar' can look nice when young, but eventually it will flop open, even under light snow. Autumn foliage is a rich orange, which is nice, but I would call this Proven Winner an unproven weener. 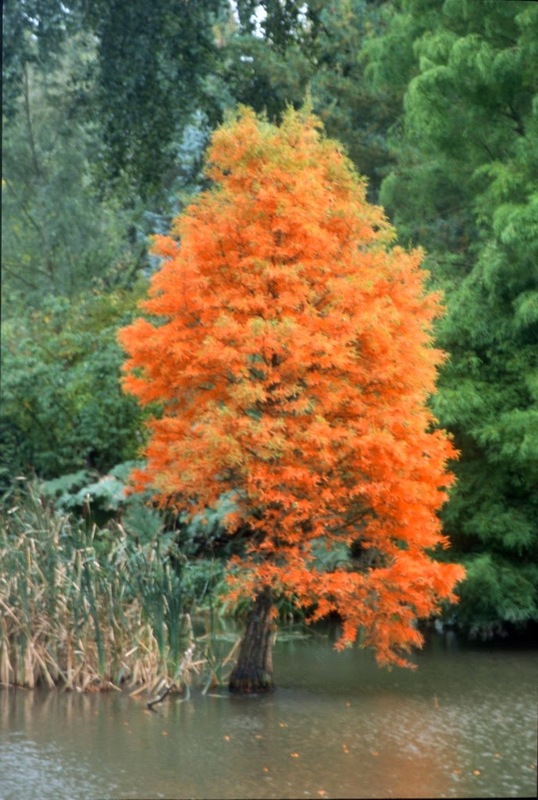 Taxodium distichum is the "Swamp Cypress," and was first classified by Linnaeus. When grown near water it can produce "knees" or pneumatophores, which are aerial roots that assist with the supply of oxygen to the trees. 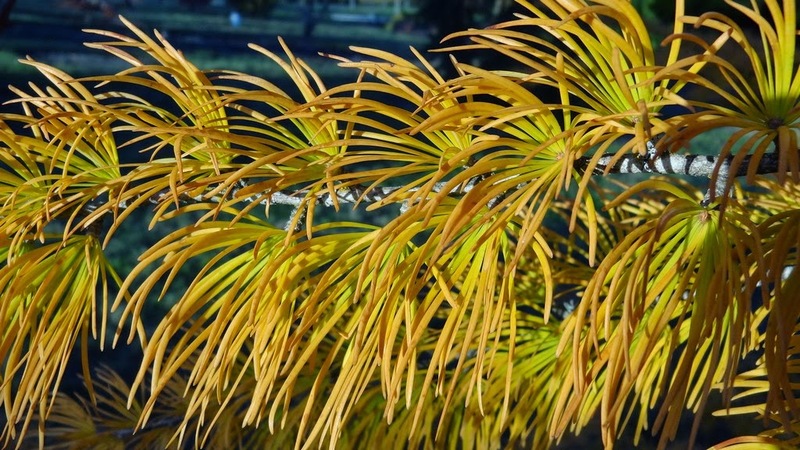 I grew a large Taxodium distichum 'Peve Minaret' in a wooden box, and with our frequent drip-irrigation throughout summer, it also began to produce knees. Since sold. 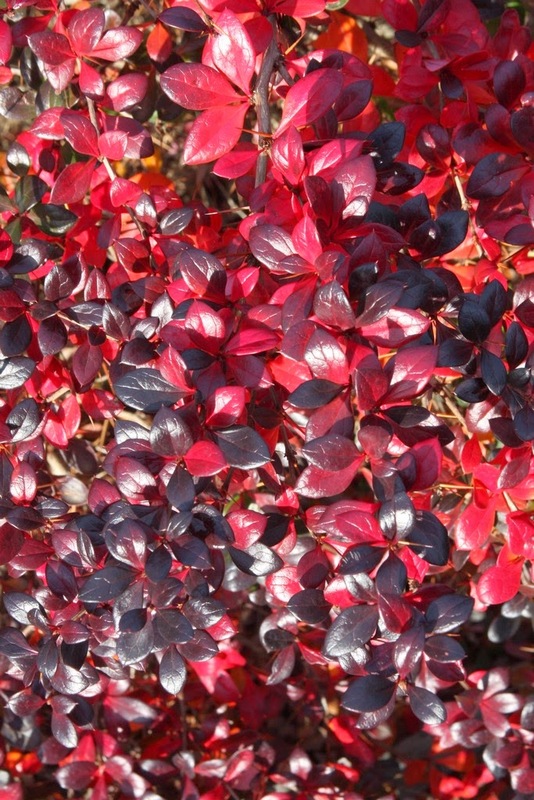 Berberis x media 'Red Jewel' originated as a sport of B. x media 'Parkjuweel' in The Netherlands. x media is a hybrid of B. x hybridogagnepainii x B. thunbergii, but you are not expected to remember that; suffice to say that 'Red Jewel' is a beautiful, small dense bush with shiny purple-red foliage. Acer tegmentosum 'White Tigress' is the name used in the trade, but it is perhaps a hybrid, and, if so, should be referred to as Acer x 'White Tigress'. 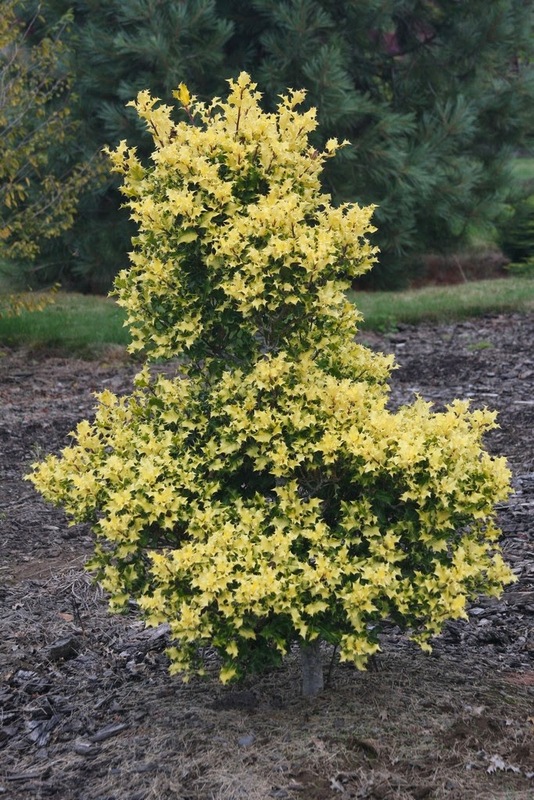 It was named and introduced by Brotzman's Nursery of Ohio around 1975. Tegmentosum is from Latin tegmentosus for "hidden" or "covered," as the leaves completely cover the branches. The species comes from Siberia, Korea and Manchuria, and was discovered by Carl Maximowicz in 1850, but was not introduced to Europe until 1895. 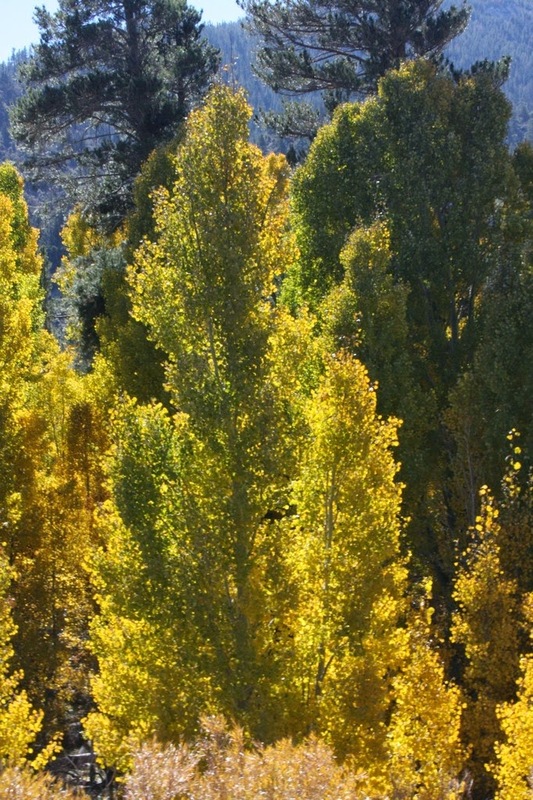 Populus wilsonii was introduced from China by E.H. Wilson in 1904, and was validly named by Camillo Karl Schneider in 1916. Schneider was an Austrian botanist who published an Illustrated Handbook of Broad-leaved Trees in 1912, but his magnum opus, a study of the genus Berberis, was destroyed by a bombing raid on Berlin in 1943. Hate it when that happens. 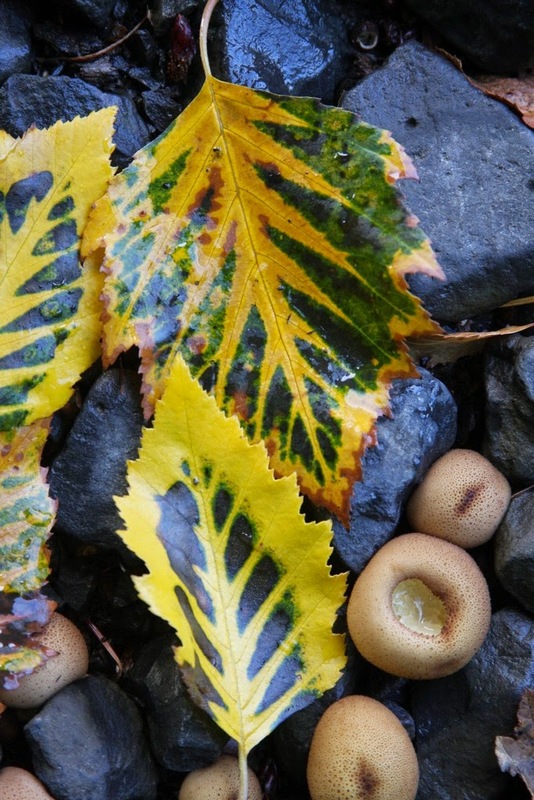 The species name for Populus trichocarpa, the "Black Cottonwood," is from Greek for "hairy fruits." 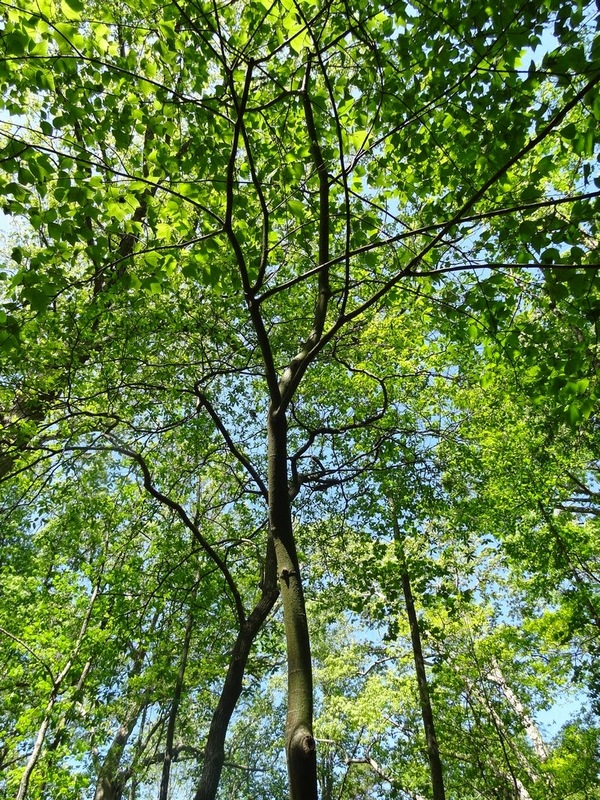 The wood is used in the production of high-quality book and magazine paper, while the Native Americans used the bark to treat baldness, tuberculosis and rheumatism. 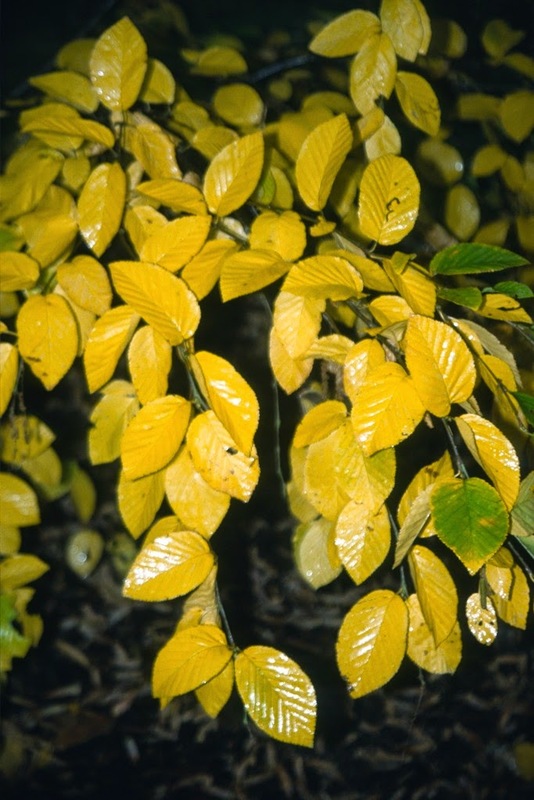 Its full genome sequence was published in 2006, the first tree species to be sequenced. 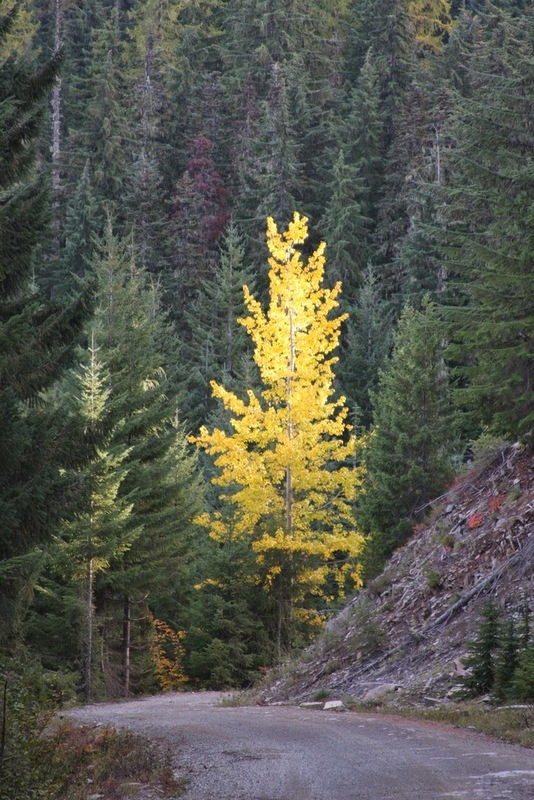 Populus tremuloides is the "Quaking Aspen," and is found from Alaska down to the mountains of New Mexico. 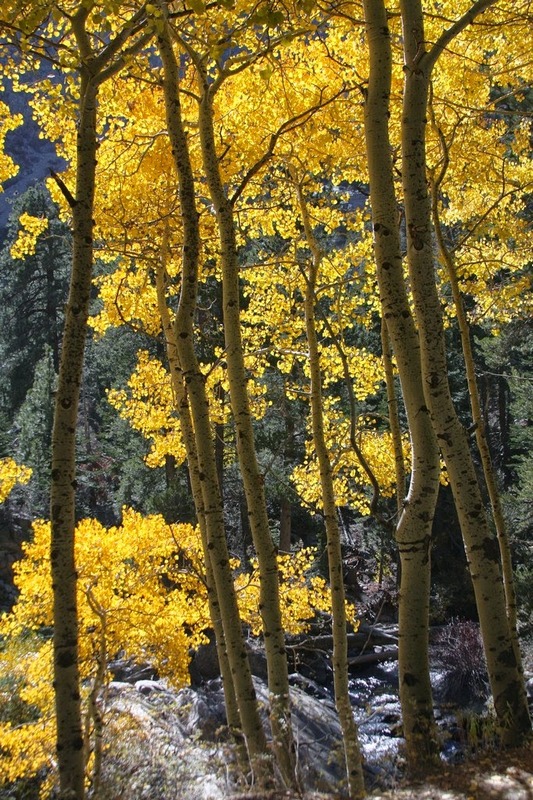 Some scientists consider the largest organism on earth to be in an area of Utah called Pando (Latin "to spread"), where all 47,000 Aspen tree trunks are connected, and the 100 acre grove could weigh as much as 13 million pounds. Other scientists will point to a fungus (Armillaria ostoyae) covering 2,384 acres in the Blue Mountains of Oregon which could be as old as 8,600 years, which would also make it one of the oldest living organisms. 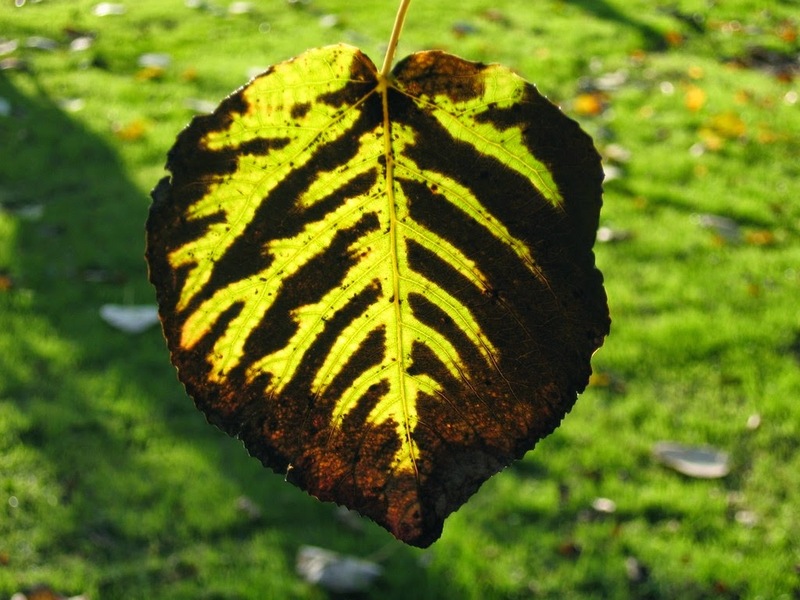 The Japanese Betula maximowicziana, commonly known as the "Monarch Birch," displays the largest leaves of the genus. I have only seen Betula medwediewii in Europe, and just as well since I have difficulty to spell and pronounce the name. 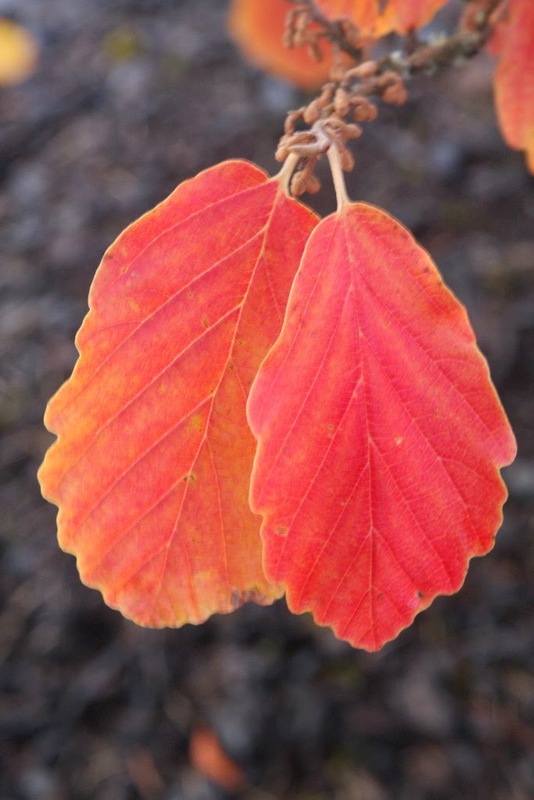 The botanic name Betula is Latin, while the common name "birch" is birce in Old English, from German birke. 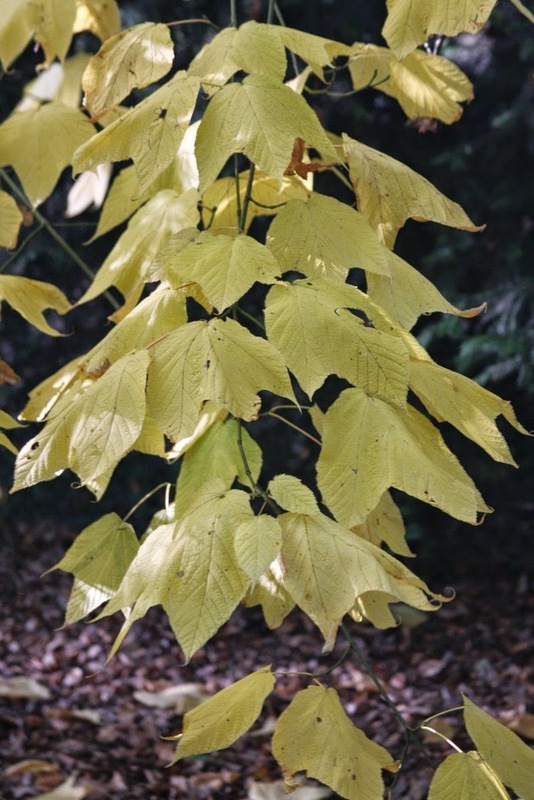 Acer pensylvanicum is the only "stripe-bark" species native to America. 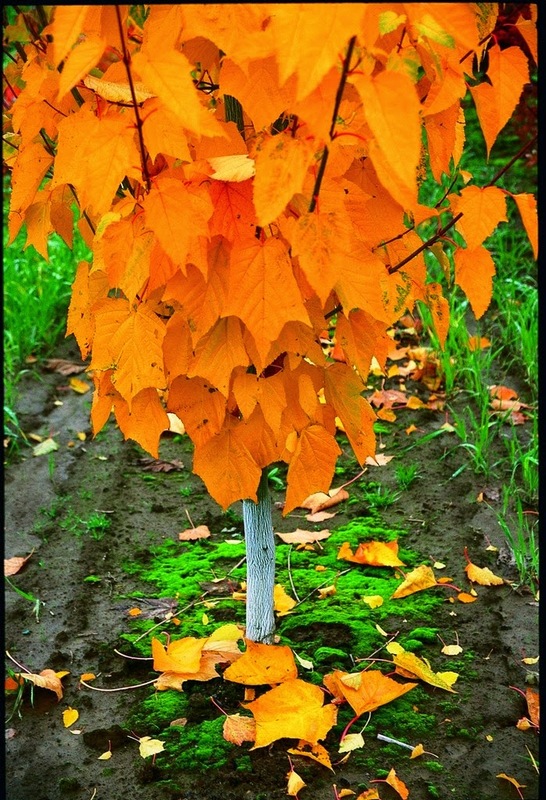 Coming from eastern USA, it is commonly called the "Moosewood Maple." 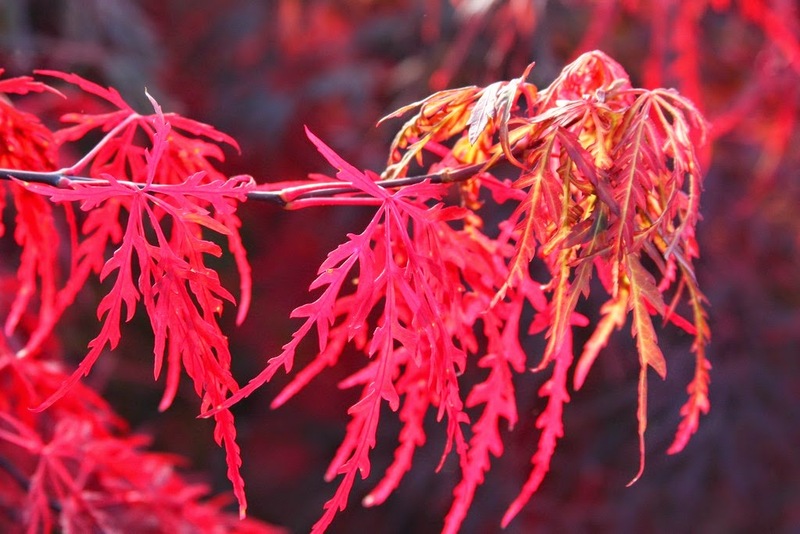 Acer palmatum 'Orangeola' originated as a seedling and was named by a plant broker – you know, the kind of guy who works half-time and never very diligently when times are good, and then must give that up and go to work at a box store when times are bad. Betula nigra Fox Valley is the trademark name of a compact "River Birch," but the cultivar name is 'Little King'. Unfortunately it has been marketed with both names, which is why I foolishly collected both of them myself. 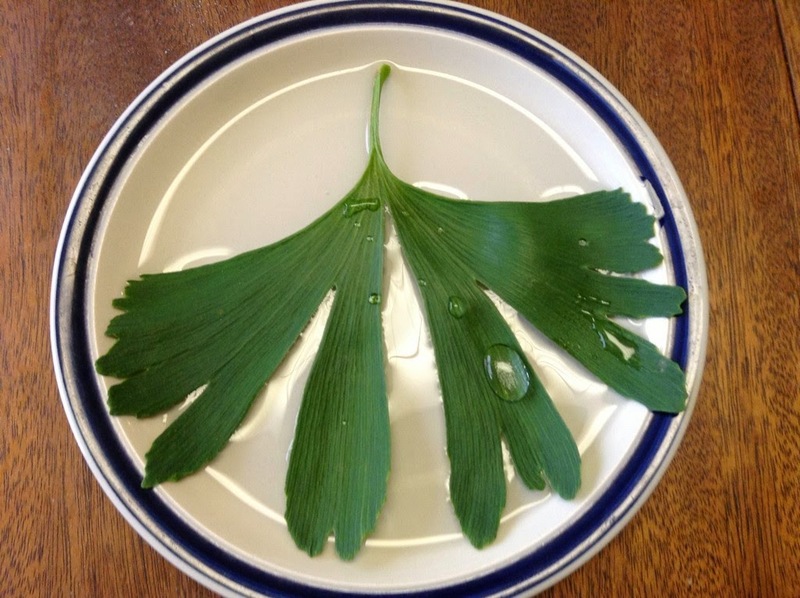 Ginkgo biloba doesn't always produce leaves with two lobes, while other times the lobes are very evident. 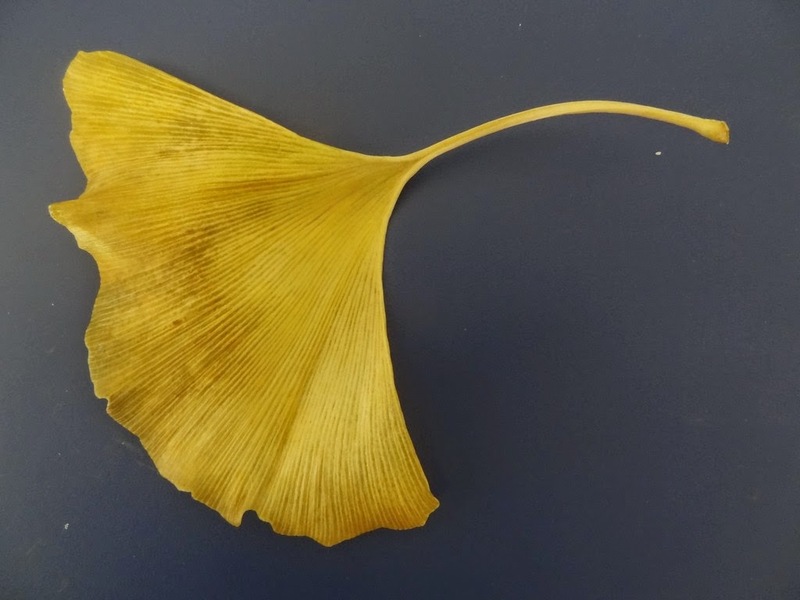 I have seen the oldest Ginkgo outside of Asia at the Utrecht (The Netherlands) Botanic Garden, a male introduced by Engelbert Kaempfer between 1730-1750. Linnaeus first scientifically described the tree in 1771, while the Chinese refer to it as yinguo, or "silver fruit" in Mandarin. 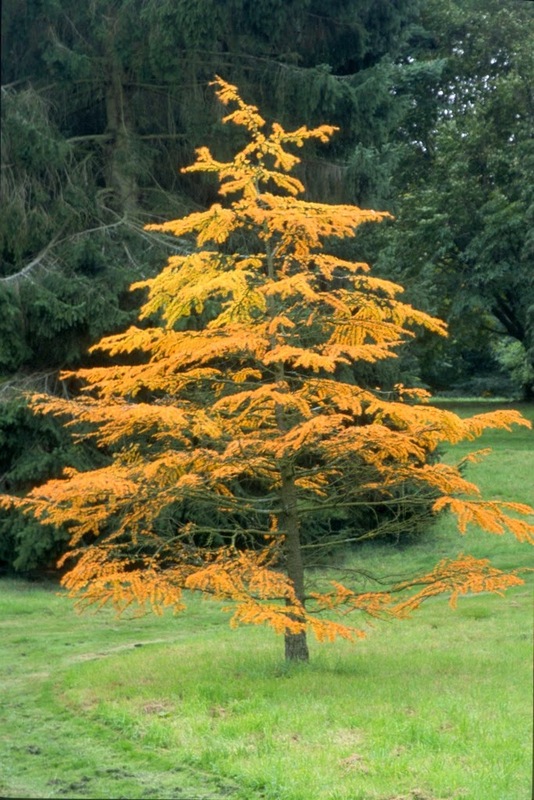 Pseudolarix amabilis suffers with its scientific name, for most gardeners dismiss it as just another larch, and the larches are often considered big trees that look dead for half a year. Too bad, unless one sees a Pseudolarix specimen for himself. 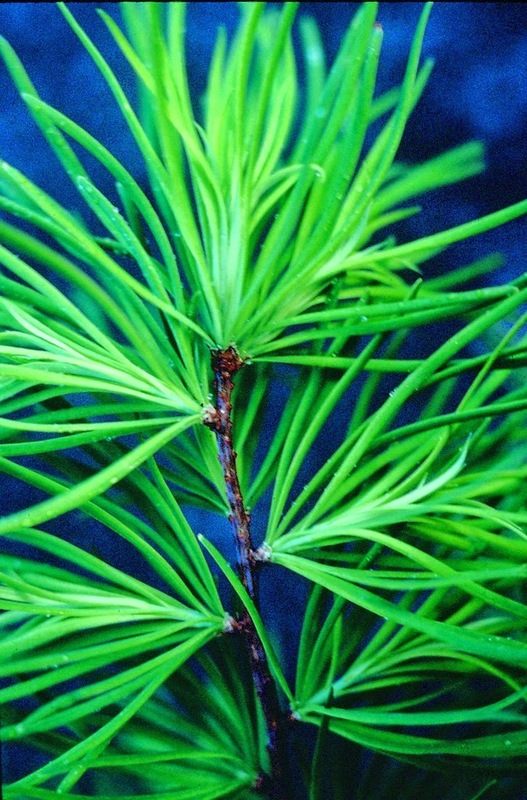 Generally Pseudolarix grows smaller than Larix species, and the green foliage is more luxuriant. 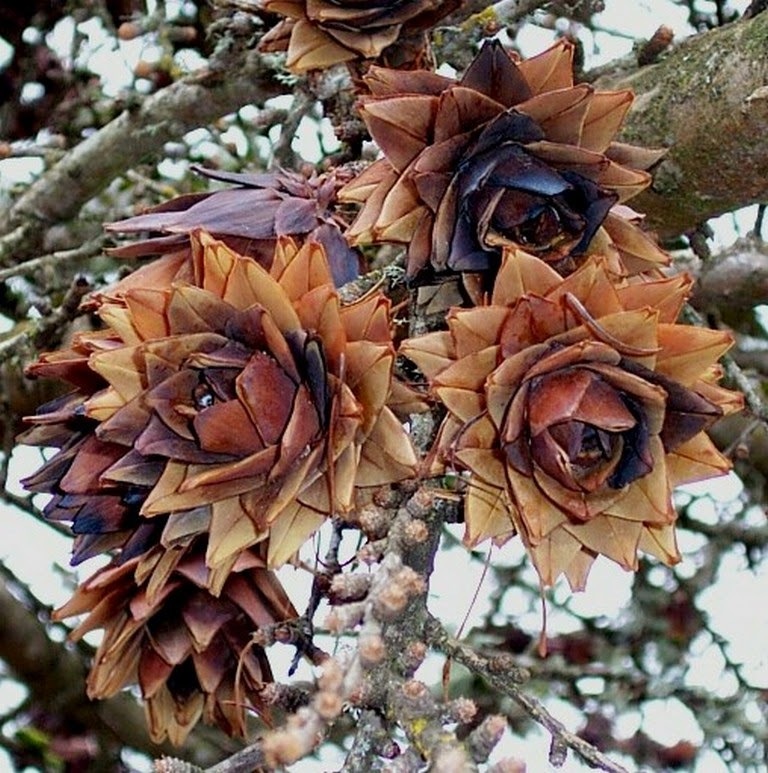 For me, the artichoke-like cones are fascinating, and I'll stop writing now and venture into the arboretum to see them. Put on a coat and come along. Acer palmatum at the Portland Japanese Garden one day before the freeze.